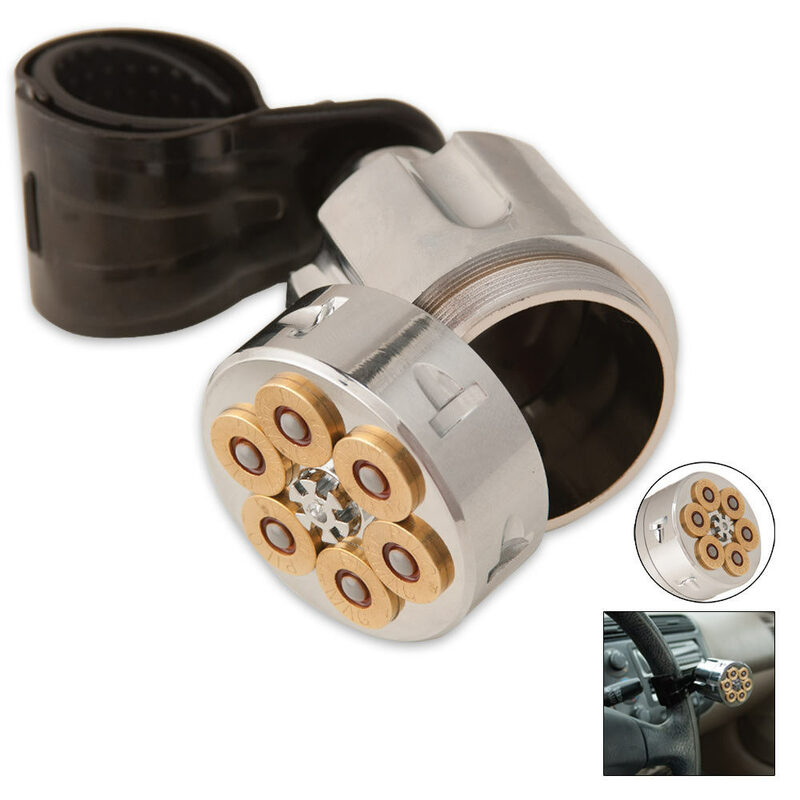 44 Magnum Steering Wheel Spinner | BUDK.com - Knives & Swords At The Lowest Prices! 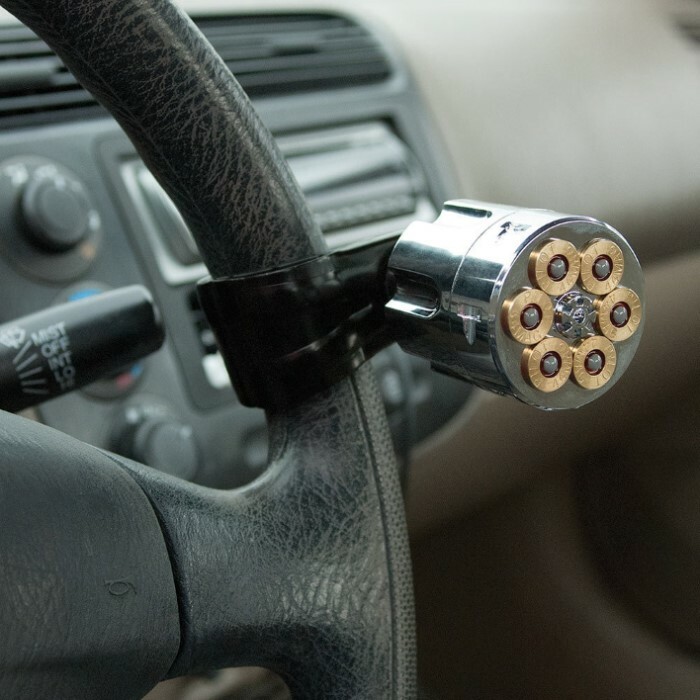 This .44 Magnum steering wheel knob is the perfect addition to pimp your ride. It not only makes it easier to turn the wheel, but also contains a hidden compartment for storing valuables. IT IS AWESOME I SUFFERED A INJURY IN 2008 WITH A TABLE SAW WITCH MUTILATED MY LEFT HAND SO IT IS HARDER TO DRIVE BUT SINCE I HAVE INSTALLED THIS IT HAS BEEN A TRUE BLESSING IT WORKS AWESOME MAKES IT A WHOLE LOT EASIER TO TURN THE STEERING WHEEL IT LOOKS AWESOME ON MY TRUCK AND I LIKE THE HIDDEN COMPARTMENT I CAN HIDE MONEY JEWELRY AND NOBODY KNOWS ITS THEIR BUT ME I WOULD HIGHLY RECOMEND IT THANKS FOR ALL THE HELP ! Thing actually works and feels like you popped it out of your magnum, nice weight and the secret compartment good for your spare change. Purchased this item thinking it was made of metal. The cylinder is made of plastic with an aluminum cap.Bearings are a little loose. We will have to see how long it lasts. Probably worth $19, but not a lot more. Looks nice. Just doesn't give a good solid feeling in your hand. I just received the product and it is b****s I own 5 .44 magnums so it not only fits me and my lifestyle, the functionality of it is amazing. When I go mudding (its like driving a boat through the mud) the hidden/stash compartment comes in a lot more handy than anyone would think. I definitely recommend this item to anyone at all. I am an extremely satisfied habitual buyer from BUDK, thanks guys again ya'll never cease to amaze me.Editor's Note: Thank you for your comments. We have removed a portion of the review which does not comply with our review guidelines.